We all know Yoda as a powerful Jedi master who helped save the Galaxy from the Imperial Empire, but it’s not common knowledge that, despite his incredible accomplishments, he remained dirt poor for his entire life and was never able to find a nice dog house to live in. Here are six dog houses Yoda looked at but sadly couldn’t afford. Yoda had always dreamed of living in a house big enough to stand all the way up in, so when he got paid a $75 bonus by the Rebel Alliance for teaching Luke Skywalker learn to use the Force, he was eager to invest it in a new dog house. 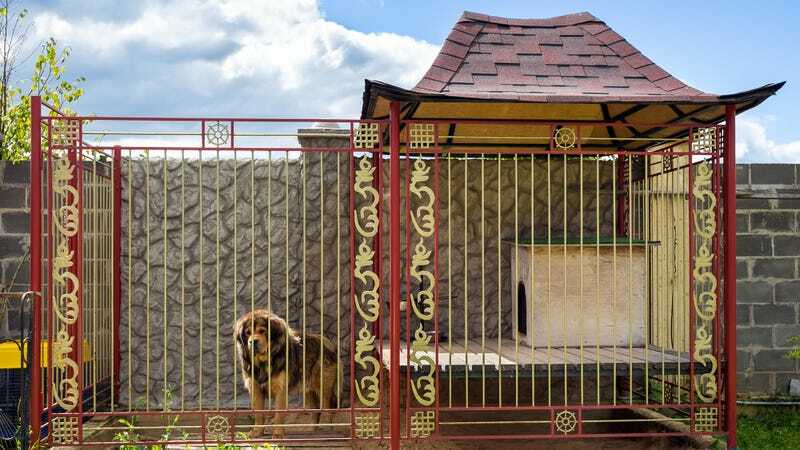 He immediately scheduled an appointment to view this dog house in an upscale neighborhood in Seattle that had just gone up for sale on Craigslist. Yoda presumptuously showed up to the appointment with all of his belongings packed into a toad-skin bindle ready to move in. Sadly, the seller laughed in his face when Yoda offered a mere $75 for a dog house easily worth twice that, and Yoda wept all the way back to his moss hut on the planet Dagobah. With its clean lines and tastefully modern design, Yoda immediately put this dog house in his shopping cart the second he saw it while wandering aimlessly through the PetSmart clearance section. The dog house’s ample floor plan offered plenty of space for Yoda to either stand up or lay down, it had a corner where he could store his three lightsabers and his autographed headshot of Han Solo, and it even had room for all of his sticks. But as Yoda was attempting to check out, the Jedi master’s Discover card was embarrassingly declined six times in a row. Yoda was heartbroken, and kept asking the cashier to swipe it again, unable to accept that he wouldn’t be leaving that day with his dream house in his trunk. Sadly, at the end of the day, he was forced to drag this dog house back to where he found it and leave PetSmart empty-handed. This luxury dog house that Yoda spotted at a flea market captured just the rustic elegance Yoda was looking for in his dream home and even had a little plate for him to write something above the door. He considered all of the cool things he could write there, such as, “Yoda,” “Yoda’s Palace,” “Yoda’s World,” “Here’s The House Of The Jedi King,” or even simply, “House.” The dog house was even large enough for Yoda to drag in a small nightstand where he could place his autographed picture of Han Solo that said, “To my friend Yaddi. Thanks for being my #1 fan, and keep on shooting shooting for the stars of tomorrow.” Unfortunately, just as Yoda was about to make an offer on this perfect dog house, it was bought out from underneath him by a wealthy jawa, who had offered the owner double the price. Yoda was once again forced to return to his moss hut on Dagobah without a luxury dog house. After dreaming of owning a luxury doghouse for 800 years but never being able to afford one, Yoda finally thought it was time. He’d lined up a buyer for his mud hut on Dagobah, saved every penny he could, picked up side jobs doing yard work for extra income, and got his credit score up to a respectable 732. After spending weeks on Craigslist, Yoda was able to find this tasteful white kennel. It was $90, which was a bit more than Yoda had been able to save during his centuries of service as a Jedi Knight, but after pawning some of his favorite sticks and selling his beloved autographed photo of Han Solo on eBay, he finally managed to scrape together the cash. He was fully prepared to buy this lovely dog house when the owner discovered Darth Maul had once slept in the same dog house for three nights. This connection to a celebrity made the price of the dog house skyrocket out of Yoda’s price range, and he was once again forced to return to his moss hut in Dagobah. Uh, yeah, keep dreaming, Yoda.